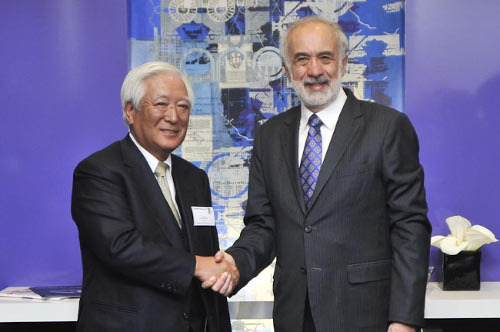 Komori Licensing Agreement signing - Mr Komori (left) and Benny Landa (right) @ drupa 2012. Image: Landa. Landa and Komori have formalized their strategic alliance by entering into multi-faceted agreements in which Komori will be the global supplier of all sheetfed Landa Nanographic Printing Press platforms to Landa and Landa will provide Komori with Nanographic Printing technology and Landa NanoInk for incorporation into Komori-branded Nanographic Printing presses. The companies had already collaborated during Landa’s development of Nanography, with Komori providing sheetfed platforms for Landa’s launch of Nanographic Printing at Drupa 2012. Since Drupa, Landa engineers have been evaluating proposals from the industry’s leading press vendors. The conclusion of this year-long pursuit led to Komori as the clear partner of choice for Landa. The outcome led Landa to place orders with Komori for sheetfed platforms for Landa’s S10 Nanographic Printing Presses, which will start to be delivered to customers in the fourth quarter of 2014.